(CNSNews.com) - The Internal Revenue Service in 2011 through 2016 documented more than 1.3 million cases of identity theft perpetrated by illegal aliens whom the IRS had given Individual Taxpayer Identification Numbers (ITIN), which are only given to people who are ineligible to work in the United States or receive Social Security Numbers, according to information published by the Treasury Inspector General for Tax Administration (TIGTA). 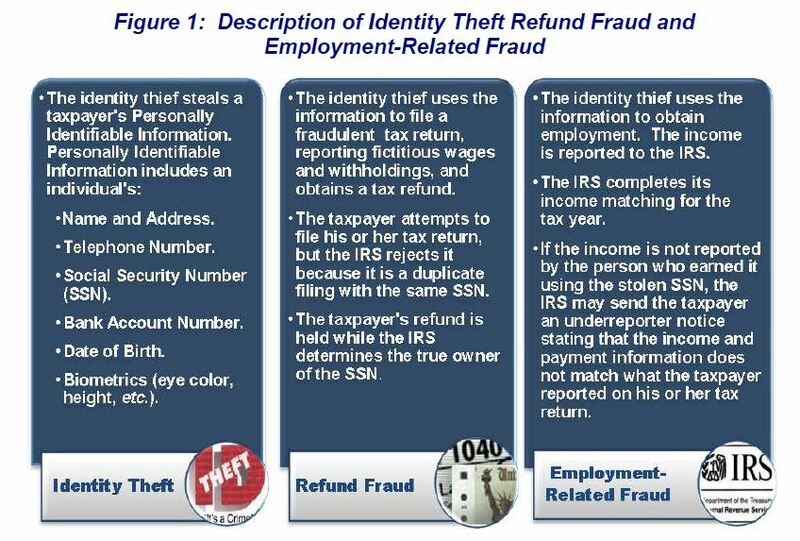 In an August 10, 2016 report ("Processes Are Not Sufficient to Assist Victims of Employment-Related Identity Theft"), TIGTA published this graphic explaining the difference between "refund fraud" and "employment-related fraud:"
“Cases of employment identity theft identified by the Internal Revenue Service usually involve an Individual Taxpayer Identification Number (ITIN) filer who used the Social Security Number of another individual, i.e. victim, to gain employment,” TIGTA said in a report released in February. “The IRS placed the employment identity theft marker on 1,346,485 taxpayer accounts between PY [processing years] 2011 and 2016 through the e-file ITIN/SSN mismatch process,” said the TIGTA report. The IRS’s ITIN/SSN mismatch process showed which electronically filed tax returns had been filed by ITIN holders but had a W-2 showing wages earned with a Social Security Number. In response to questions from CNSNews.com, TIGTA said that in these 1,227,579 cases “over 1 million valid” SSNs issued by the Social Security Administration were used by ITIN holders. In the remainder of the cases, the ITIN holders used fabricated SSNs. The IRS first began issuing ITINs in 1996. The purported purpose was to give foreign nationals who have a tax liability inside the United States an identification number to use when filing tax returns. To qualify for an ITIN, an individual must be a foreign national and must not be eligible to receive a Social Security Number. So, who gets an ITIN? The chief counsel of the IRS determined that the foreign nationals living inside the United States who qualify for an ITIN—because they are not eligible for a Social Security Number—are in fact illegal aliens. A Policy to "'Legalize' Illegal Aliens"
In 2011, as reported by TIGTA, the IRS started systematically placing “a code on the tax account of the innocent taxpayer whose SSN was used to commit employment-related identity theft” by ITIN holders who filed electronic—but not paper—returns. At the urging of the inspector general, the IRS also began notifying these taxpayers when the IRS used this code to mark them as having been the victim of this type of identity theft. In 2014, the IRS ran a small pilot program to make these notifications. Then, in 2017, it attempted to notify all victims who were discovered through its tracking of electronic tax returns. This year, it intends to inform all victims, including those whose SSNs were used by an ITIN holder filing a paper return. But the two largest numbers in the report were 1,346,485 and 1,227,579. The 1,346,485 were taxpayers the IRS had “marked” as victims of employment identity theft because their SSNs had been used by ITIN holders on tax returns that the IRS processed in 2011 through 2016. The 1,227,579 were tax returns filed by ITIN holders in 2017 that TIGTA discovered had used an SSN that did not belong to the ITIN holder or was fabricated. “Over the last few years, IRS-Criminal Investigation prioritized its limited resources pursuing identity thieves who stole millions of identities from innocent taxpayers and applied for, and received, tax refunds based on those identities. “Additionally, based on how IRS-CI captures case-related information and how prosecutions are based (the federal violation utilized), it is not possible to ascertain the exact information for the question regarding how many cases IRS pursued criminally where ITIN holders utilized another individuals’ SSN. “We don’t confirm or deny investigations or comment on referrals,” said a Justice Department spokesperson.